Bryant Park Blog: Ask Bryant Park: Where Can I Find Winter Village FAQs? 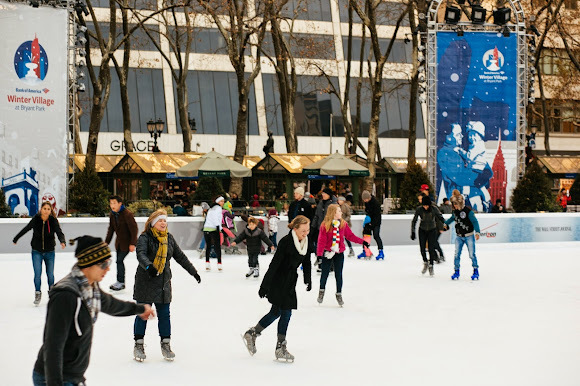 Ask Bryant Park: Where Can I Find Winter Village FAQs? When the Bank of America Winter Village opens each year, we get a flurry of questions about the who, what, where, when and why of The Rink, the Holiday Shops, Celsius, pricing, and more. To make the whole process easier on our visitors, this year we have rolled out a new and improved Winter Village FAQ section on the website. To make things even easier for all you Winter Village visitors, we're posting the whole FAQ page here as well. Check it out before you arrive at the park to find out more about the little details you may find yourself thinking about later on in your visit. The new and improved FAQ page features all the Q&A's you may have about all things Winter Village. If for some reason your questions isn't answered by the page, give us a call at 212-661-6640 or email wintervillage@urbanmgt.com. Admission to skate is free. Skate rentals are available for $15/pair ($19/pair Nov 26, 2014-Jan 4,2015). Click here for detailed information about pricing. What types and sizes of skates are available for rental? - 80% of our rental skates are lace-up. We also have hockey skates. Is The Rink open if it's raining or snowing? The Rink will close during heavy rain or severe storms; for updates click here. The status of the rink is posted on the top left side of the site, and updated throughout the day. How long can I skate on the ice? Skating time limit is approximately 1.5 hours so that everyone can enjoy free public ice skating at The Rink. Where can I leave my bags/shoes while skating? Lockers are located inside the Skating Pavilion and are free of charge. All personal items must be stowed in a locker. Purses are not allowed on The Rink. Bring your own lock or purchase one inside the pavilion. Bag check service is also located inside the Skating Pavilion for a fee. How big are the free lockers in the Skating Pavilion? Lockers are one square foot and hold a pair of shoes and a small personal item. How many items can you fit in the bag check? - The small bag check container is 22"x28". It is usually suitable for 2-3 people. - The large bag check container is 30"x40" and is generally suitable for 3-5 people. Can I use my phone or camera on The Rink? Cell phones and cameras are not allowed on the ice. Can I make a reservation to skate? You can make group reservations here. Solo skaters can buy a FastPass in order to skip the line. Yes, click here for more info on skating lessons at The Rink. Can I get my skates sharpened at The Rink? Yes, skate sharpening is available inside the Skating Pavilion for a fee. Can I play hockey at The Rink? Hockey games are not allowed during normal rink hours. What can I do while waiting for skaters? I need socks for ms skates! Are they available purchase? Not in the Skating Pavilion, but while the Holiday Shops are open (until Jan, 4, 2015) you can buy socks at Soxeteer and Bergies Super Socks. Are the Holiday Shops open on Thanksgiving, Christmas, and New Year's Day? A large percentage of shops are open on holidays, but some will choose to close. Yes, most of the Holiday Shops take credit cards. Yes, an ATM is located inside the Skating Pavilion. Are the Holiday Shops open during inclement weather? The Holiday Shops will be open during normal rain or snowfall. They will close if the park is closed due to dangerous weather conditions, or if there is a severe storm. How can I contact a Shops vendor? If you are having trouble finding a vendor, please call 212-661-6640 and our Shops experts can help you. I want to be a vendor at the Holiday Shops. Who do I contact? Please call 212-661-6640 or email info@upsilonventures.com. I'd love to host a party at Winter Village. How do I do that? There are several options for parties at Winter Village: plan a group skate, rent the Parka Lounge, book a party at Celsius, and more. Call 212-661-6640 for more information. Is Celsius in the park year-round? No, Celsius is a "pop-up" winter restaurant that complements The Rink at Winter Village. Celsius does not take advance reservations. I want to make a reservation at the Bryant Park Grill. Please call the restaurant at 212-840-6500.